Citation Information: J Clin Invest. 2015;125(4):1569-1578. https://doi.org/10.1172/JCI80115. Maintenance of skeletal muscle structure and function requires a precise stoichiometry of sarcomeric proteins for proper assembly of the contractile apparatus. Absence of components of the sarcomeric thin filaments causes nemaline myopathy, a lethal congenital muscle disorder associated with aberrant myofiber structure and contractility. Previously, we reported that deficiency of the kelch-like family member 40 (KLHL40) in mice results in nemaline myopathy and destabilization of leiomodin-3 (LMOD3). LMOD3 belongs to a family of tropomodulin-related proteins that promote actin nucleation. Here, we show that deficiency of LMOD3 in mice causes nemaline myopathy. In skeletal muscle, transcription of Lmod3 was controlled by the transcription factors SRF and MEF2. Myocardin-related transcription factors (MRTFs), which function as SRF coactivators, serve as sensors of actin polymerization and are sequestered in the cytoplasm by actin monomers. Conversely, conditions that favor actin polymerization de-repress MRTFs and activate SRF-dependent genes. We demonstrated that the actin nucleator LMOD3, together with its stabilizing partner KLHL40, enhances MRTF-SRF activity. In turn, SRF cooperated with MEF2 to sustain the expression of LMOD3 and other components of the contractile apparatus, thereby establishing a regulatory circuit to maintain skeletal muscle function. These findings provide insight into the molecular basis of the sarcomere assembly and muscle dysfunction associated with nemaline myopathy. Lmod3 is expressed selectively in the skeletal muscle and heart. 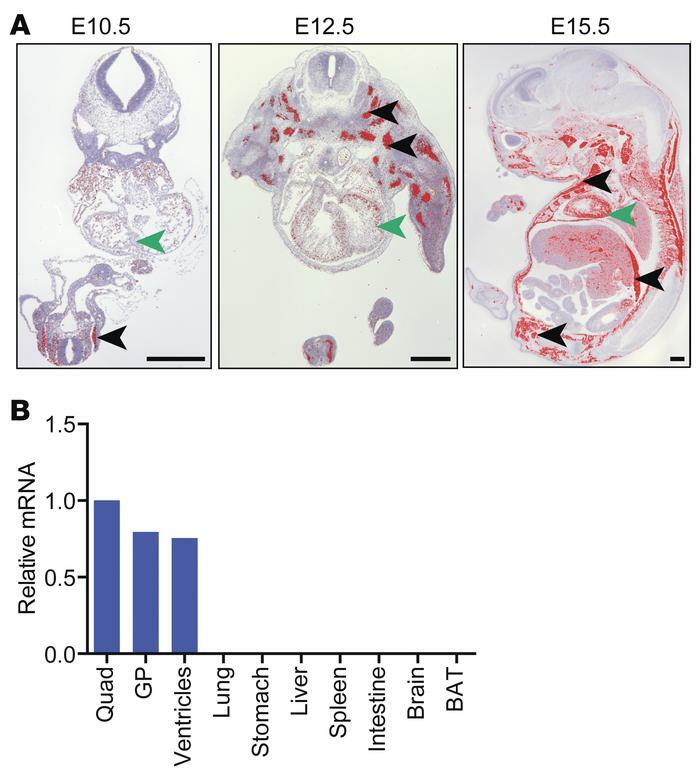 (A) ISH analysis was performed on transverse sections of E10.5 and E12.5 embryos and sagittal sections of E15.5 embryos using radioisotopic antisense RNA probes against Lmod3. Black arrowheads denote developing muscle in E10.5 and E12.5 sections and intercostal muscles, diaphragm, and developing muscle groups in the limb bud in the E15.5 section. Green arrowheads indicate the heart. Scale bars: 500 μm. (B) qPCR analysis of Lmod3 in an adult mouse shows heart- and muscle-specific expression. Experiments were performed in triplicate, and expression was normalized to 18S rRNA. Quad, quadriceps; GP, gastrocnemius and plantaris; BAT, brown adipose tissue.